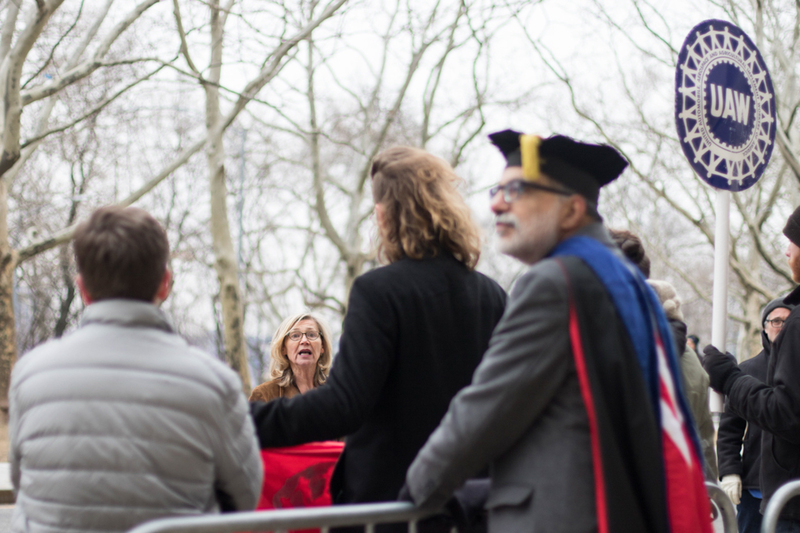 Georgette Fleischer, a founding member of the Barnard Contingent Faculty, speaks during a protest outside President Beilock’s inauguration. Barnard President Sian Leah Beilock was inaugurated as Barnard’s eighth president and shared her vision for the college’s future amid the interruptions of pro-union protesters at Friday’s ceremony in Riverside Church. Beilock began as president in July after the unexpected departure of former president Debora Spar to Lincoln Center, where she now serves as president and CEO. Following tradition, Beilock spent her first semester engaging with the community and formulating her vision before being inaugurated. Beilock, who is only 42, received her Bachelor of Science degree in cognitive science from the University of California, San Diego, before heading to Michigan State University, where she earned a doctorate degree in both Psychology and Kinesiology. She was on the faculty of the University of Chicago since 2005, serving as the Stella M. Rowley Professor of Psychology, as well as the vice provost for academic initiatives and the executive vice provost and an officer of the university, before coming to New York. In her research Beilock focused on women’s anxiety and academic performance. In her address, Beilock presented a vision for Barnard that consists of four main objectives: continued focus on science as essential to a liberal arts education, engaging with New York City as an extension of the classroom, including outreach in Harlem and Morningside Heights, continuing the college’s diversity and inclusion initiatives, and increasing resources to better prepare students to succeed after graduation. Members of Graduate Workers of Columbia, the Barnard Contingent Faculty union, and Student-Worker Solidarity staged protests outside the inauguration, with several protesters entering the event with signs during speeches by University of Chicago President Robert Zimmer and Columbia University President Lee Bollinger. In a pamphlet distributed during the protests, BCFU alleged that since becoming president in July, Beilock has refused repeated requests to meet with the union to discuss the college’s failure to reappoint seven adjunct professors this past fall, which members said violated the terms of Barnard’s contract with the union. In September, the group also protested Convocation for the same alleged complaint. Despite silent interruptions from pro-union protestors, the inauguration proceeded largely as planned and included greetings from many of Beilock’s former advisers, current faculty, staff, and students, as well as members of the board of trustees. Smith College President Kathleen McCartney greeted Beilock on behalf of the remaining Seven Sisters colleges and spoke of the continued need for women’s colleges amid the current political climate and allegations of rampant workplace sexual harassment. At the start of her speech, Beilock said that Barnard is continually committed to advancing women in science, technology, engineering and math. While women remain underrepresented in most STEM fields, at Barnard about one-third of students are science majors. In order to continue supporting students in science, Beilock identified the new Cheryl and Philip Milstein Teaching and Learning Center as an important resource that will also include a new center for engaged pedagogy. Kaythari Maw, BC ’21, said she considered Beilock to be a role model and an inspiration to students not only studying STEM, but in all disciplines. As executive vice provost at the University of Chicago, Beilock oversaw UChicago Urban, an interdisciplinary consortium that seeks to integrate university members with the broader Chicago area. The program partners university scholars with civic and community leaders to address urban concerns and propose solutions. Beilock said she will look to increase the number of combined bachelor’s and master’s degree programs that Barnard has with Columbia and that she is currently considering the potential for combined programs between Barnard and both the Mailman School of Public Health and the School of Engineering and Applied Sciences. Beilock also grappled with how to ensure the college continues to increase the diversity of its student body. In order to ensure that Barnard remains accessible to students of all backgrounds, Beilock said she is committed to continuing the college’s policy of need-blind admissions. Beilock also discussed the college’s newest initiative, Beyond Barnard, which launched early last week. The program seeks to streamline and consolidate the college’s career, graduate and professional school, and research and competitive fellowships advising, as well as internship and student employment services. Brittany Pavon Suriel, BC ’09, TC ’15, said that she was excited by Beilock’s vision and the ongoing commitment of Barnard and Columbia to one another. “I am hopeful for the future of Barnard and that we [will] continue to increase in global recognition without losing sight of New York City and the community that we’re a part of,” Pavon Suriel said. Prior to the start of the event, approximately two dozen protesters from the Barnard Contingent Faculty Union, Graduate Workers of Columbia, and Student-Worker Solidarity gathered outside of Riverside Church to protest Beilock and University of Chicago President Robert Zimmer and Columbia University President Lee Bollinger, both of whom delivered speeches welcoming Beilock to Barnard. While Zimmer discussed Beilock’s role as the executive vice provost at the University of Chicago, one protester made his way onto the stage and handed the president a letter from Graduate Students United, University of Chicago’s graduate student union, declaring its intent to bargain despite Zimmer’s continued refusal. Following the exchange, the protester was escorted out of the church by security. During Bollinger’s speech, protesters entered the church a second time and walked up a center aisle but were stopped before reaching the stage. The protesters’ other grievances included Beilock’s alleged refusal to meet with BCFU and Columbia’s refusal to bargain with GWC. Sonam Singh, an adjunct professor in the English department and a representative of BCFU, which represents adjunct, term, and other full-time non-tenure track faculty and won its first contract last year, cited the presence of Zimmer and Bollinger as his primary reason for attending the protest. Representatives from Student-Worker Solidarity, a group of Barnard and Columbia undergraduates advocating labor and economic justice on and around Columbia’s campus, stood alongside BCFU and GWC. Despite the tensions between administrators and protesters, Beilock emphasized her commitment to the student body and their future success. Lilly Anderson, Ainsley Bandrowski, Caprice Herjavec and Susu Rawwagah contributed reporting.